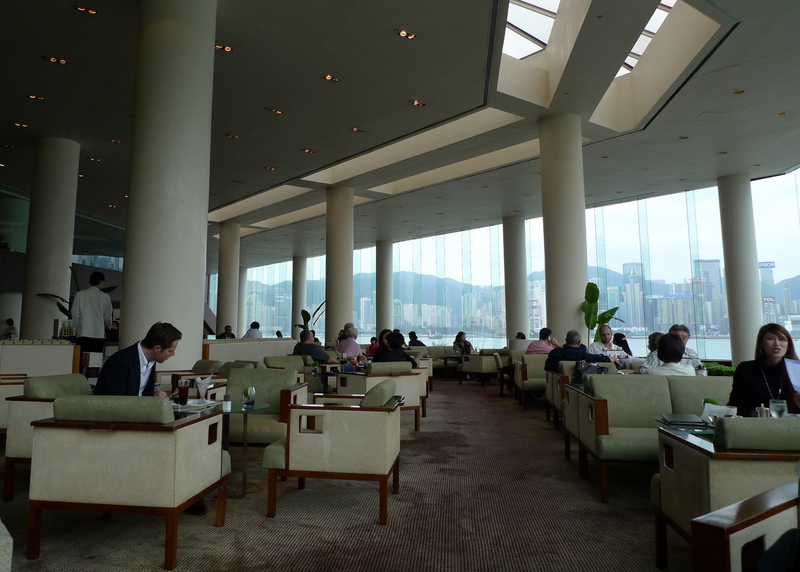 As our trip to Hong Kong came to its conclusion, Tawn and I went to the Intercontinental Hotel on the Kowloon waterfront for afternoon tea. With its panoramic view of the harbor, the Intercon offers a relaxing and refined way to spend your afternoon. You end up feeling mighty sophisticated just because of the setting. 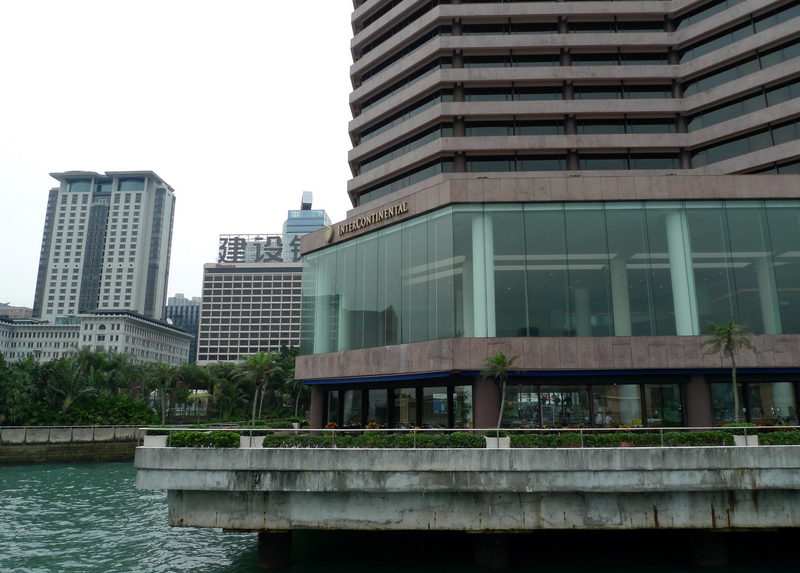 Located right along the Avenue of the Stars, a pedestrian walkway along the East Tsim Sha Tsui waterfront dedicated to the stars of Hong Kong cinema, the Intercon is a short walk from the MTR and Kowloon Railway stations. In the background to the left is the venerable Peninsula Hotel and, next to it, the Sheraton. The Peninsula is famed for its afternoon tea but, I’ve been told, is both pricey and filled with tourists. The Intercon offers both the option of either a simple tea service or an extravagant one while offering a view the Peninsula doesn’t. And maybe slightly fewer tourists, although I can’t tell for certain. The view from just outside the Intercon, showing the Avenue of the Stars walkway. This being a reasonably clear day, you can see Victoria Peak back behind the IFC Tower. The lobby of the Intercon is spacious and bright although the carpet could use a refresh. Service is very attentive and friendly, though, and I felt very at home. There was a full tea service that offered sandwiches, pastries, and other snacks. 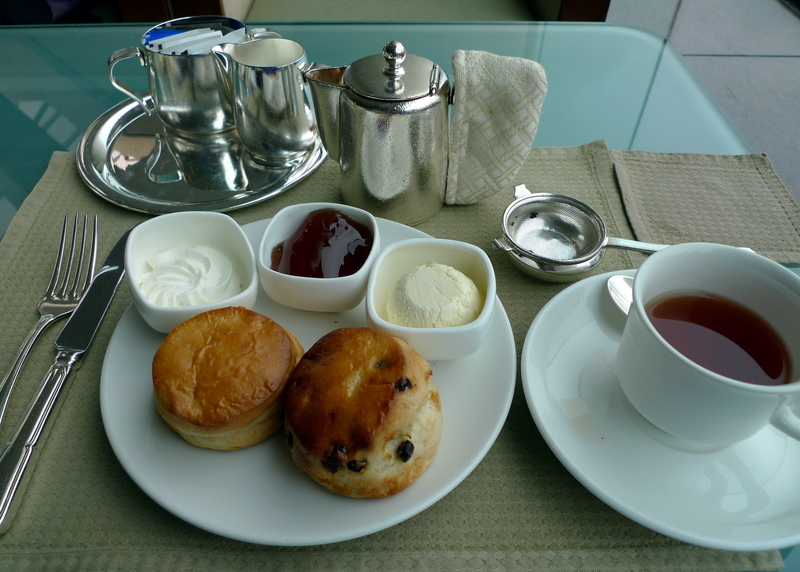 Since we had eaten only a few hours before and had a large dinner planned, we went for the simple scone and tea option. The teas are from Mariage Frères, a venerable Parisian company that has been producing fine teas for over 150 years. It is also the “house tea” at our Bangkok condo. (Yeah, I know that sounds horribly pretentious!) In fact, it is the brand of tea Tawn served when he had the opportunity to meet Martha Stewart a few months ago at a friend’s shop. The silver tea service is heavy and functional, not at all dainty and elegant. The scones are tasty and the clotted cream and jelly are generously served. An extra pot of hot water sits on the table and the server stops by every so often to top off your cup. Certainly a very relaxing and refined way to spend an hour in the afternoon and a nice way to complete our trip to Hong Kong. I think I should take tea in hotels more often. And isn’t Tawn adorable in this picture? As we say in Thai, na-rak jang leuy! That evening, we had dinner at Aqua, the Japanese Italian fusion restaurant that overlooks the Hong Kong harbor from the top floor of One Peking Road. I didn’t provide a write-up on the restaurant for two reasons: first, it was a little too dark for food pictures even with my camera; second, our hosts were the brother and brother-in-law of the owner. We received some special considerations so I’m not sure I could objectively evaluate the restaurant. I will say that the view is spectacular and the food is very good so if you’re looking for a high end destination restaurant, it is worth considering. I hope you’ve enjoyed the series on the Hong Kong eats. In the next few days I’ll put them all on a Google map and share that with you, in case you want to reference them on a future visit to Hong Kong. Thanks for all your comments and feedback on the entries. 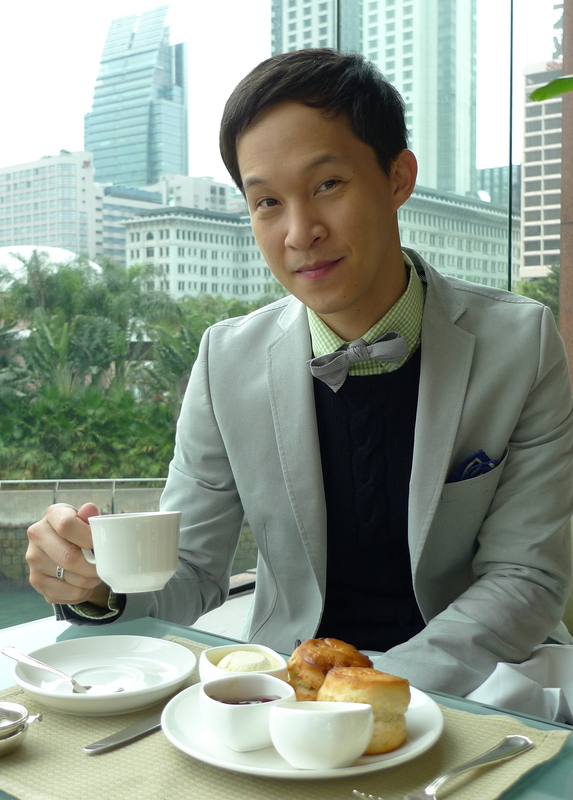 This entry was posted in Uncategorized and tagged Dining, food, hong kong, Intercontinental, Kowloon, tea by christao408. Bookmark the permalink. you guys sure know how to eat in style! i really like these hong kong entries because i am going there at the end of the year and i’m planning on eating my way around the place. From your pics, it was indeed quite a busy afternoon at the Intercon….and the 80s setting is still there…wonder if it’s going to change any sooner! ?….oh I havn’t really had food at the Aqua just been there a couple of times for Happy Hour/Drinks…too bad food pic is not available..
Tawn is always so dapper.. I wish I was even a percent as stylish as he is. It’s ironic that I dress so carelessly and have no style considering that I am a designer. Tawn is always dressed well. He has style! And the photo is great (just a hint of amusement). 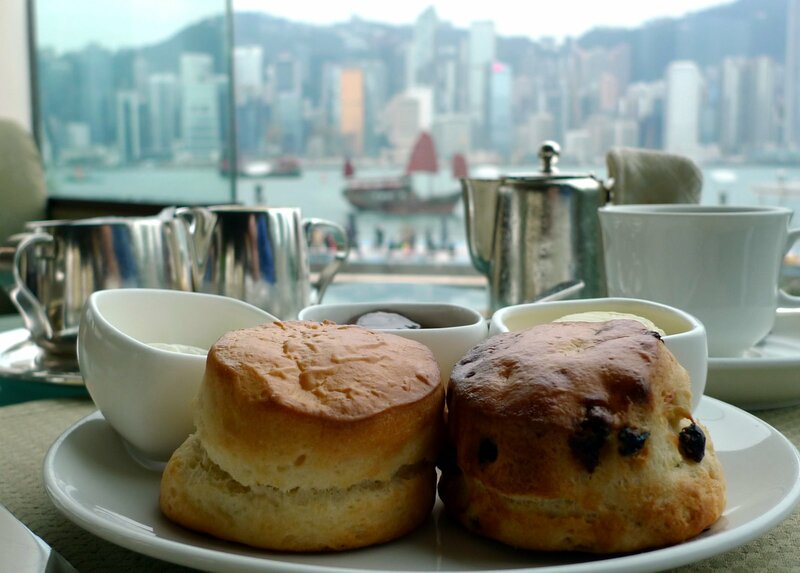 Sounds like you ate your way through Hong Kong… The scones look light and all the ones I’ve had have been like rocks, heavy rocks. Guess I need to experience better scones. Enjoyed the series of HK eateries! Nice series of food adventure in HK! The view of the harbour is sure very nice. And Tawn is so nicely dressed, as always! Tawn looked great in the photo. Scones + cream and tea is one of my favorite snacks. I’ve been to a few teas before. It really is such a nice way to spend an afternoon. PS. I love Tawn’s bow tie! Mariage Frères as your house tea? Not pretentious at all! It’s my house tea, after all. I wake up to a Wedding Impérial (how can you beat chocolate caramel black tea?!) or a Russian Breakfast from them every morning. When I don’t have my Mariage Frères, though, I have Fortnum & Mason as back-up options. Wait, maybe that is pretentious… Oh well. It’s also very tasty. 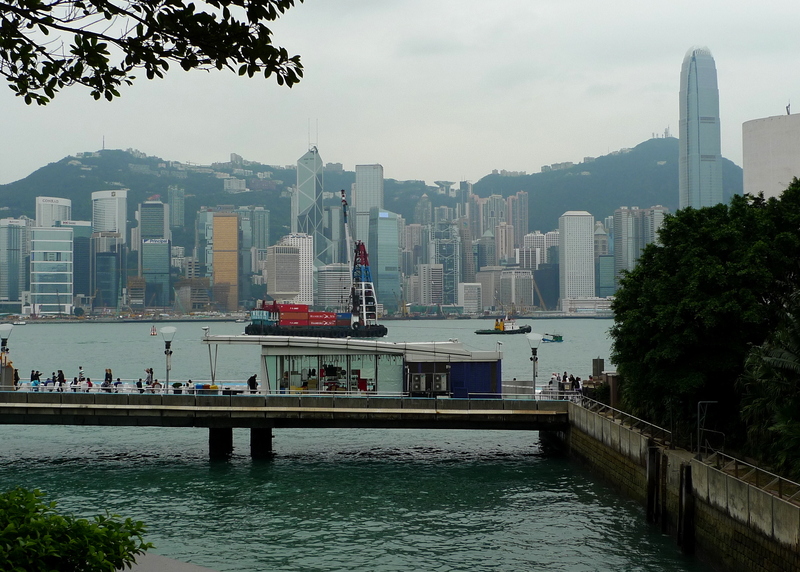 i also enjoed my visit to hong kong and had tea at the intercontinental hotel on the kowloon waterfront and was fun to see pics of hong kong again. i was impressed by the steep mtns on one side and the ocean on the other side. from hong kong i went to kunming to the stone forest and then to beijing for a limo tour of two days it was nice to have a drive and a guide who knew where all the western toilets were : > then i went on a cruise down the yantzee river thru the locks and caught a plan to shanghi. i like the archetiture in shanghi but kunming took first place with all the flowers and trees and birds and great fresh foods. @Dezinerdreams – Are you kidding me? We see plenty of pictures of you looking fashionable. @agmhkg – That’s it! I couldn’t put my finger on it but the Intercon does have a very 1980s feel to it. @stepaside_loser – I’m going to combine all this information into a Google Map and post it here so people have a reference of recommended places to eat. @murisopsis – Flaky scones, just like my flaky buttermilk biscuits except without buttermilk! @beowulf222 – The Intercon is your favorite hangout space or the Walk of the Stars? @yang1815 – Glad you enjoyed. @CurryPuffy – @waiszeblogs – @TheCheshireGrins – @Senlin – Thanks for your nice words about Tawn and his bowtie. @grannykaren – That sounds like quite a trip! Thanks for subscribing to my blog; I hope you enjoy it. @Mike A – A man with taste such as your cannot be called pretentious. “Refined,” certainly, but not pretentious. @christao408 – love to hear about peoples trips and see the pics especially overseas. have you ever been to the salisbury plains in england? i want to go there one day. Familiar pictures of the Intercon…I have some of us in that area in 1999. Can you believe it’s been that long? We didn’t have time for tea, that I can recall. Tawn does look very dapper in this photo. I think the photographer does a credible job of capturing that quality in Tawn, however. @brooklyn2028 – You are sophisticated, Sheldon. @grannykaren – Other than London proper, I haven’t yet explored anywhere else in the UK. @beowulf222 – Ah, now I know where to find you. LOL@jandsschultz – Capturing the “Tawn-ness” of Tawn? @christao408 – i have only been to bristol didn’t care for it but the salisbury plains are where the druid ruins are so wanted to go see avebury henge tried to go to stonehenge but didn’t work out and then found out it is all fenced in and you can’t go in only look thru the fence. @iskrak – “Reminds me of my own homemade buttermilk biscuits” would have been a clearer thing for me to write. As for service in Asia, it is something that I really enjoy about living here and really miss when back in the US. Crazy idea, huh, to treat customers like they are important? @christao408 – Yes, although the high tea set in the Intercont is not the best out there. 🙂 But the tea, drinks (as in booze), sandwiches, and simply the atmosphere are very nice. Hence, my hangout spot. 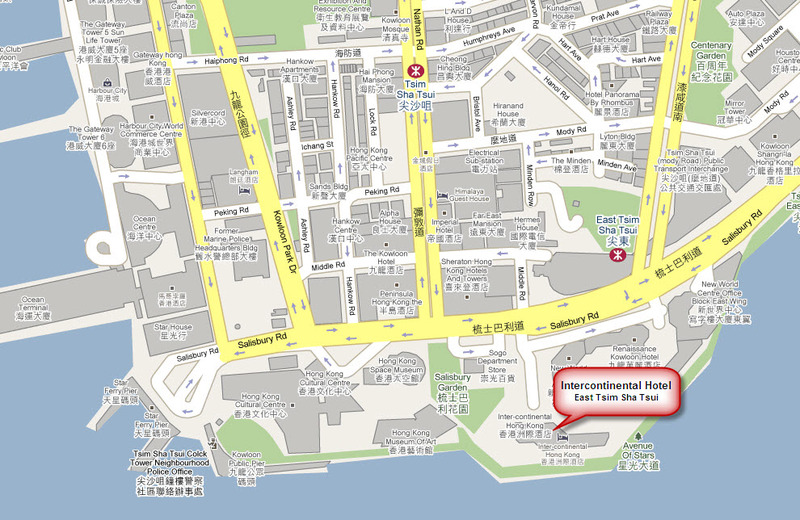 I think it’s easy to find me in HK … there are only a few spots I frequent regularly. Hahaha. You’re not pretentious Chris. You’re just better than the rest of us. :o)But your HK trip looks nice and relaxing. I wish I could site and have tea on the waterfront. But alas, the bf is not here to have tea with me…guess I’ll just have to grab a dashing fellow on the beach to chat with. Hehe. @kenpcho – Aren’t you guys travelling somewhere soon. Hey, will we see you in Omaha and Taipei for an upcoming wedding? =D@beowulf222 – I’ll make note of those! Ha ha…@rudyhou – I haven’t figured out why, by high tea really is something that doesn’t always fit the schedule. I think it is because of the time. Mid afternoon there’s always something else going on and then you don’t want to ruin your appetite before dinner, especially if you know you’re going somewhere good. Tawn seems to enjoy this life style, he fits right in! I ate at Aqua once, and the view was spectacular. Indeed the lighting was very very dark and take food pic with a frash would have everyone in the room give you a dirty look. The food there was fancy and tastety, and the bills was equally spectacular. I wish I was lucky like you to know the owner. @stevew918 – The view really makes the place, though. You’re sitting 29 stories high sitting looking out on that broad vista of all of the harbour. Amazing! @lcfu – Which Starbucks is that? The one over by the science museum? I even have my pinky sticking out while typing this comment. The views are very nice. I could sit there all day staring out at the Harbour. I think this hotel was my cousin’s favorite when he was traveling to HKG on business years ago. Btw – the picture with the scones in the foreground and the window in the background is a classic. You even have that tour boat nicely framed between the pots.I really enjoy your travelogues. They are always so well done and polished. @ElusiveWords – Thank you, Matt. I saw the boat out on the harbor and spent a few minutes composing the foreground so it would be ready if and when the boat crossed the background. @christao408 – I’m guessing Tawn is used to all of this by now? HK wasn’t like that when I went back last year! @JL789 – Really? What was it like?